Last week, Million Dollar Decorators--my now favorite design show--debuted on Bravo. When I saw the previews, I thought to myself, who is this absurd chick claiming she can easily spend $5 million smackers decorating a house?... I don't know why I thought that was absurd, knowing that I absolutely could and would do the same. 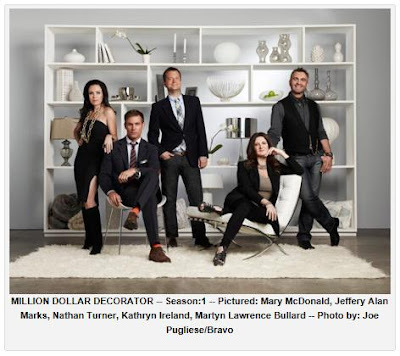 Once I tuned in, I soon found it was my beloved designer extraordinaire Mary McDonald. She is my glamour doppelganger, y'all. Seriously. The show airs Tuesday nights at 10PM on Bravo. 1. Mary McDonald's fabulous office and scenes from her house, which is too deliciously deco'ed out for words. 3. The one-liners. With people saying things like "Sometimes I think my job is more important than the President of the United States", "If I get really wound up, I manage to raise my heavily botoxed eyebrows and scare everybody", and "Mary is the pied piper of the gays because she's fabulous!" (for anyone who doesn't know me, I can sooo relate. The gays love me and I love them; gay men flock to me) how can you go wrong? Honestly. 4. Martyn Lawrence Bullard, my diva, self-important doppelganger. He actually says in the pilot, "I try not to be too much of a diva, although there is a diva side to me". Martyn, quityalyin'. LOL. 5. Via the previews, I saw that they end up in Jimmy Choo empress' Tamara Mellon's home on some episode. Her house is the business. 6. Jacqueline. She has a terrifically hysterical French accent and chews gum with her mouth open. ...and get back to me with your thoughts if/when you watch!